Ever notice that after vacation you need a vacation? Well, that's how I'm feeling. You take five days off and it takes ten days to play catch up. I'm exhausted now. Anyhoo....my house is clean, the bills are paid and the companies are all caught up! So, it's time to get back into the swing of things...a somewhat "normal" routine (if there is such a thing). Like two younglings howling that there's nothing to do is "normal", right? I did promise that we would start doing some fun summer stuff and I am going to uphold my end of the bargain...as long as they let me get some of my stamping time in. I have all good intentions to get some much needed scrap booking done too. I actually have vacation pictures to scrap this year! I held my annual New Catalog Open House this past weekend. It was so nice to see everyone! I really enjoy the time we spend together. Over the next few days, I'll be posting the cards that I had made for the Open House. I'll start by showing you this card. I had seen the cattails done about a year ago on the SCS site. I'm sorry, I don't remember who I had gotten the idea from but I have been meaning to do this ever since I first saw it. I put a wash of watercolor on for the background. I misted water directly onto watercolor paper and then used a sponge to lightly brush on some color (Dusty Durango & Crushed Curry--yes, new In-colors). 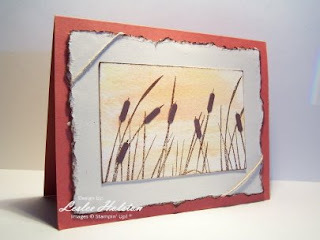 Then in Soft Suede, I stamped the grasses from the set Inspired by Nature. 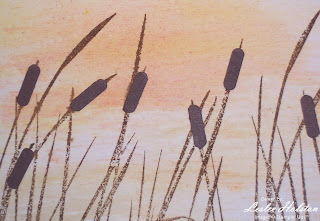 The cattails are made by using the punch out pieces from the slot punch (in Choc. Chip). I adhered these using my 2-way glue pen. I matted the watercolored image onto Naturals Ivory card stock. I simply tore the edges and drug it across the Soft Suede ink pad. Some natural hemp twine on opposing corners and it's all layered onto a Dusty Durango card base. I really love how this card turned out. It has a very masculine feel to it. Change the colors and it could be very feminine. I think I will have to try it. 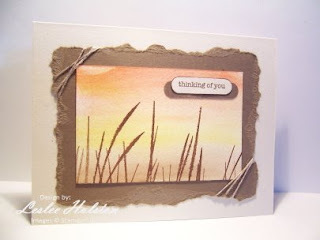 This next card is the same concept, same colors, different layout of the colors and no cattails. I used linen thread in the corners and added the sentiment from Teeny Tiny Wishes, that I had punched out with the word window punch. I had sponged a bit of Soft Suede on the background too. Again, a real masculine card. What do you think? Well, that's it for today. I hope you've been inspired to give that thing you've been wanting to do a try. I finally did and love it!!!! Thanks for stopping by, come again soon.